lower part of the brain, adjoining and structurally continuous with the spinal cord. The upper segment of the human brain stem, the pons, contains nerve fibers that connect the two halves of the cerebellum. , escape of blood from the circulation (arteries, veins, capillaries) to the internal or external tissues. The term is usually applied to a loss of blood that is copious enough to threaten health or life. ..... Click the link for more information. ). Survival and prognosis depend upon the cause, extent of damage, and duration of the coma. The term persistent vegetative state was coined in 1972 to describe an unconscious state in which sleep and wake cycles remain and eyes may open, but there is no thinking, feeling, or awareness of one's surroundings (although one may react reflexive to certain stimulations). The brain stem is usually relatively intact but the cerebral cortex is severely impaired. It is this state that sometimes results from resuscitation and life support of people who otherwise would have died; partial emergence from such a state sometimes occurs with a year or two, but not after that. 1. The most obvious part of a comet when it is close to the Sun. It consists of a diffuse luminous nebulous cloud of gas and dust that surrounds the comet's nucleus and is formed by the sublimation of ices and ejection of dust particles from the nucleus. The brightest part of the coma is the central region nearest the surface of the nucleus, where the density of material being released is at its highest; the gas density in this region is typically 1013 molecules per cm3. The visual boundary of the coma merges with the sky background. A coma's size varies with the comet's distance from the Sun and with the amount of material being released from the nucleus but can grow to typically 104 to 105 km in diameter. The luminosity of the coma is mainly produced by fluorescence from a variety of carbon, nitrogen, hydrogen, and oxygen radicals and reflection of sunlight by dust particles. The shape seems roughly circular but fan-shaped comas have been reported. The material comprising the coma is extremely rarefied: even faint stars shine through. 2. 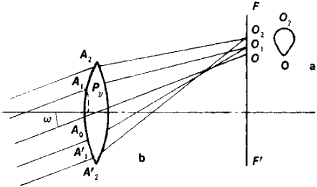 An aberration of a lens or mirror that occurs in a telescope when the light falls on the objective or primary mirror at an oblique angle. The light is not imaged as a point in the focal plane but as a fan-shaped area: each zone of the lens or mirror produces an off-axis image in the form of a circular patch of light, the diameter and position of the circle center varying steadily from zone to zone (see illustration). The dimensions of the resulting combination of zone images, i.e. the fan-shaped image, depends on the obliquity of the light falling on the lens or mirror. See also aplanatic system. a life-threatening condition characterized by loss of consciousness, severe decrease or absence of reaction to external stimuli, extinction of reflexes (to the point of complete disappearance), disturbance of the depth and frequency of respiration, change in vascular tonus, acceleration or deceleration of the pulse, and upset of temperature regulation. Coma is a consequence of deep inhibition in the cerebral cortex extending to the subcortex and lower sections of the central nervous system, as a result of acute disruption of blood circulation in the brain, head injury, inflammation (encephalitis, meningitis, malaria), intoxication (barbiturates, carbon monoxide), diabetes mellitus, uremia (urémic coma), and hepatitis (hepatic coma). In addition, there is disruption of the acid-base equilibrium in nervous tissue, oxygen starvation, disturbances of ion exchange, and energy starvation in the nerve cells. A precomatose state, during which the symptoms indicated develop, precedes coma. The condition can be treated by eliminating the primary causes of the coma and taking measures aimed at restoring the acid-base balance, reversing collapse, restoring respiration, and combating oxygen starvation. an aberration of optical systems in which each part of the system at a distance d (circular zone) from the axis gives the image of a luminous point as a ring with a radius that increases as d increases; the centers of the rings are not coincident, so that their superposition, that is, the image of the point produced by the system as a whole, takes the form of an asymmetrical, diffuse spot (see Figure 1). The size of this spot is proportional to the square of the aperture angle of the system and the distance of the point-object from the system’s axis. 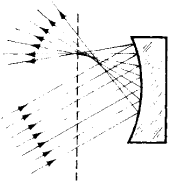 The coma is very large with parabolic mirrors; it is, in fact, the principal factor limiting their visual field (see Figure 2). In complicated optical systems, coma is usually corrected together with spherical aberration by matching lenses. If one of the lens surfaces is off-center when a system is assembled, coma will also distort the images of points located on the system’s axis. a tuft of simple or pinnate hairs at the apex or base of the seeds of certain plants, for example, the willow herb. The coma is an outgrowth of the seed coat, or testa. It promotes distribution of seeds and fruits by means of wind, water, and animals. The gaseous envelope that surrounds the nucleus of a comet. Also known as head. A cathode-ray tube image defect that makes the spot on the screen appear comet-shaped when away from the center of the screen. Unconsciousness from which the patient cannot be aroused. A manifestation of errors in an optical system, so that a point has an asymmetrical image (that is, appears as a pear-shaped spot). a state of unconsciousness from which a person cannot be aroused, caused by injury to the head, rupture of cerebral blood vessels, narcotics, poisons, etc.